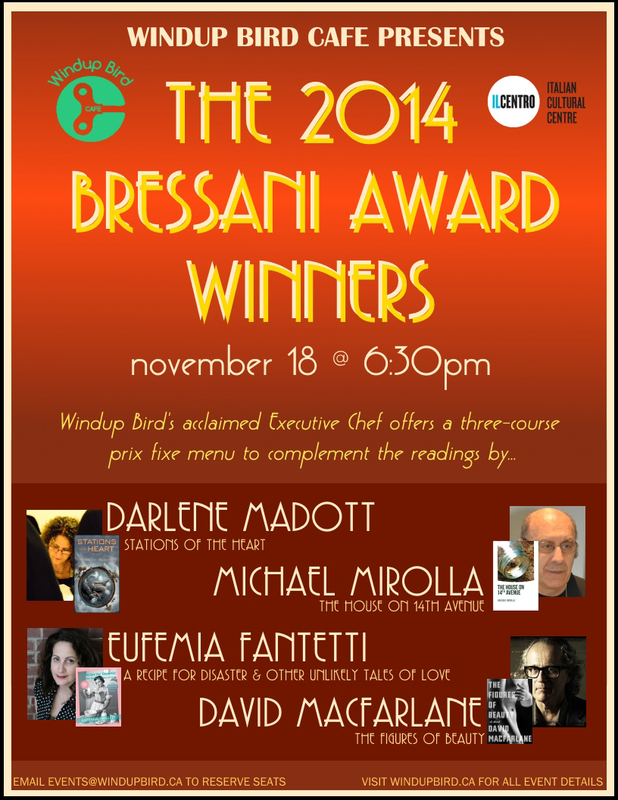 On Tuesday, November 18th at 6:30pm, the acclaimed executive chef of the Windup Bird Cafe will be serving up a delicious three-course meal alongside the wonderful prose and poetry of the 2014 winners of the Bressani Award. The winners for this year include Darlene Madott, Michael Mirolla, Eufemia Fantetti, and David Macfarlane. Darlene Madott is a Toronto lawyer and writer. Prior to law, she worked at Saturday Night and Toronto Life magazines. Her call to the Bar in 1985 coincided with the publication of a collection of short stories, Bottled Roses, (Oberon, 1985). A film script, Mazilli’s Shoes, was published by Guernica in 1997, then Joy, Joy, Why Do I Sing? was published by Women’s Press/Scholar’s Press in 2004. Included in that collection was “Vivi’s Florentine Scarf,” which won the 2002 Paolucci Prize of the Italian American Writer’s Association. Her short fiction has garnered literary awards, including the title story “Making Olives,” which won the Bressani Literary Award in 2008. Michael Mirolla is a novelist, short story writer, poet and playwright. Publications include two novels, the recently-released The Facility, and Berlin (a 2010 Bressani Prize winner and finalist for the 2009 Indie Book and National Best Books Awards); two short story collections – The Formal Logic of Emotion (recently translated into Italian and released in 2010) and Hothouse Loves & Other Tales; and two poetry collections: the English-Italian Interstellar Distances/Distanze Interstellari (2008), and Light And Time (2010), His short story, “A Theory of Discontinuous Existence,” was selected for The Journey Prize Anthology, while another short story, “The Sand Flea,” was nominated for the Pushcart Prize. Eufemia Fantetti is a graduate of The Writer’s Studio at SFU and the University of Guelph’s MFA in Creative Writing. Her fiction, nonfiction and plays have been published in the anthologies Contours, Beyond Crazy, eye wuz here and Fish 2012. She has won the 2009 Event Magazine Non-Fiction Contest, the 7th annual Accenti Writing Contest and is a two-time finalist for the Theatre BC National Playwriting Competition. David Macfarlane has published several books to much acclaim. His first book, The Danger Tree, won the Canadian Authors’ Association award for non-fiction while Summer Gone, was nominated for the Giller Prize and won the Chapters / Books in Canada first novel prize. Currently, Macfarlane writes a weekly column for the Toronto Star. Tagged with Darlene Madott, David Macfarlane, Eufemia Fantetti, F.G. Bressani Literary Prize, Michael Mirolla, Poetry, windup bird cafe.